Pat Munro manufacture structural concrete to high specifications and supply throughout the Highlands of Scotland, from our production plants in Alness, Dornoch, Inverness and Elgin. We use our own aggregates to produce a wide range of concrete mixes to suit any purpose, from house foundations to specialist high-strength mixes for bridge construction. Subsequent delivery to site, including over long distances is carried out using our flexible fleet of Ready Mix Trucks, specially adapted to accommodate delivery to remote and distant locations. With our unique blend of in-house skills, we have a full appreciation of factors affecting construction and how we can best adapt our concrete service to suit specific construction requirements of our clients. Stringent quality control techniques are used to ensure that we meet clients specifications at all times. Our own on-site laboratory carries out sampling, curing and testing on a continual basis. 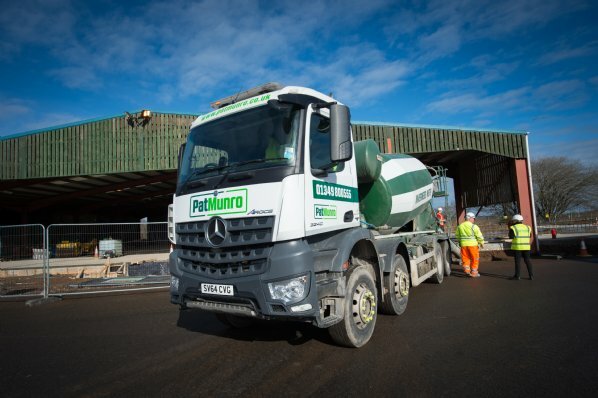 We have a wealth of experience in design and supply of specialist concrete mixes to suit specific contract requirements. These include lightweight and high-flow concretes, high strength grouts, sulphate resistant concrete, and under-water concretes. Pat Munro are licensed suppliers of Cemfloor Floor Screed product in the North of Scotland, see more about Cemfloor Floor Screed at www.cemfloor.co.uk. Pat Munro produces all its Ready Mix Concrete to the prestigious BSi Kitemark Standard within a quality management system that is externally accredited to ISO 9001 by BSi. Our Kitemark certificates for the Caplich and Dornoch sites are available here. We manufacture ST, prescribed, design and designated mixes, and for more information on other specific requirements contact our Commercial & Technical Manager. We have prepared a Ready Mix Recipe Sheet to help you find what mix you need, and it is availabe here. If you know the dimensions of the area you need for ready mix you can use our handy Product Calculator. This works out the approximate quantity required and sends an email to us, and we will then contact you to progress the order.